Some more details are beginning to appear on what will take place inside the ride. Remember this is not officially confirmed information, and is therefore always subject to change. 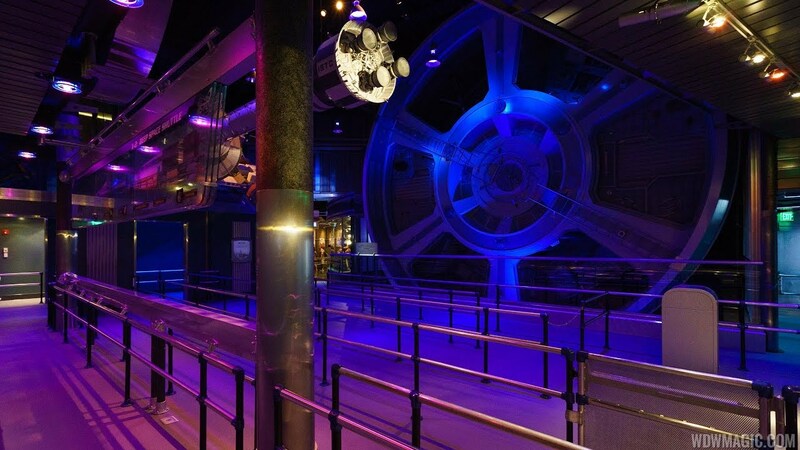 The queuing area inside the International Space Training Center, contains a series of railed areas, similar to Test Track, with a huge Gravity Wheel suspended on one of the walls. There are a number of International flags hanging from the ceiling, representing the International feeling of the training centre. The flight pods each contain 4 seats, with dividers running between each seat. Each seat is equipped with an "over-the-shoulder" restraint, and its own sound system. The pod's interior is very detailed, with a large number of controls and displays in front of the seats, each equipped with a joystick. The pods are far larger than the Cyber Space mountain pods. Standing is possible, similar to Star Tours in scale, but obviously only sized for 4 persons. The ride is going to begin with the launch countdown, expect some psychological effects to build the tension here. As launch approaches, the seats will roll back into the launch position (facing upwards, on your back), you will feel the engines roar, and blast off. Expect to be faced with large G Forces, and an immense feeling of speed as the craft escapes the Earth's pull. During the flight there will be simulated weightlessness effects. Each member of the 4 person team will have a mission to do during the flight. The outcome of the mission will depend on how well the team performed.